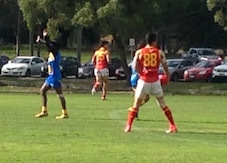 The China Dragons maintained their unbeaten record at the IC17 today, with a 14-point win over Sri Lanka at the Mentone Grammar Keysborough Playing Fields. In sunny conditions, the Chinese controlled the first half of the match before the Sri Lankans piled on five unanswered goals in the third term. Whilst it looked like Sri Lanka were set to clinch the win at 3/4 time, the Dragons steadied in the final term, kicking 4 goals straight, whilst Sri Lanka could only manage a single point. The match opened with the Chinese dominating possession, but struggling to build a structure. Whilst the Chinese were taller and quicker, the Sri Lankans showed early that their plan was use their more imposing physiques to hit the Dragons hard physically. The first quarter saw Sri Lanka tackling hard and flooding their defence, frustrating China's chances to score. #25 Chen Ziwei opened the account for China, goalling after a free kick for a high tackle. Chen Shaoliang showed the class that he has accumulated while training at Port Adelaide, setting up numerous chances up forward. After Sri Lanka's first goal of the match was kicked by speedster Damian Ratwatke, the score stood China 2.1 to Sri Lanka 1.0 at quarter time. The second quarter saw the heat rise again, with tempers starting to fray. Chen Long marked and took a set shot on goal, but whilst his kick was fairly ordinary, Pi Jiaming roved the pack to kick China's first for the quarter. 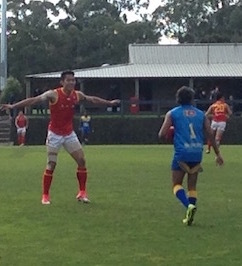 Chen Shaoliang followed this up with a strong mark and goal from 40 metres out. For Sri Lanka, Damian Rawatke continued to shine, adding his second goal to see the scoreline China 5.2 to Sri Lanka 2.0 at half time. The Sri Lankan coaches at the main break were encouraging their players to keep up the uncompromising physical challenge on the Chinese, whilst the Chinese coaches told their side to focus on the ball rather than the man and try to open up the match and play to space. By the time the third quarter opened, the pressure being applied by the Sri Lankans was starting to show on the Dragons, who were starting to look tired. Despite giving away undisciplined free kicks for high tackles and stepping over the mark, the Sri Lankans were gaining the ascendancy. When Rawatke nailed his (and his side's) third goal for the match, the passion of the Sri Lankans started to really fire up. Buoyed by their vocal supporters on the sidelines, the Lions piled on five unanswered goals for the quarter, taking the lead after Ramanushan Gowriswaran goaled from a free kick. The Chinese looked like they had stopped in their tracks, with Sri Lanka leading by 9 points at the last change, 7.1 (43) to China 5.4 (34). The final term opened with China turning the tide through Pi Jiaming sharking the ball out of the centre and nailing Chen Shaoliang with a long and accurate pass. Chen goalled to bring the margin back to just 3 points. Sri Lanka pushed into attack, looking dangerous around goal multiple times, but the Chinese defenders stood tall and were able to hold off. Deng Xiaoyu goalled to retake the lead for China. The Sri Lankans started flooding their defence, crowding the packs in the defensive 50m arc. This held up the Chinese advances for a while, but left Qiu Xiaoshan open to receive the ball in space, goal and put the margin back to 9 point in China's favour. When the final siren sounded, the scoreboard showed the Chinese 14 point winners, 9.4 (58) to Sri Lanka 7.2 (44). Tempers flared again after the final siren, with the umpires intervening to try and stop the two sides piling on before it became an all-in melee. The Chinese national anthem rang out in full voice, with the Dragons happy (and probably a little relieved) to have weathered the storm and taken the win. The Sri Lankans for their part, whilst it will now be hard for them to make the 1st vs 2nd playoffs for the Division 2 final, showed they will be a force to reckon with in future as they develop as a squad. This Saturday sees China going in as favourites over Indonesia, whilst Sri Lanka will meet Croatia in what is sure to be an entertaining and bruising encounter.